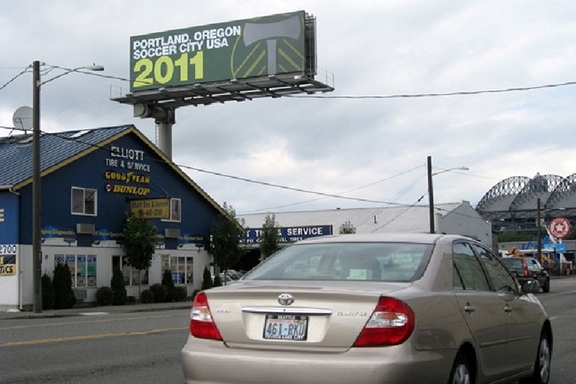 This billboard got things started last year but Saturday's contest with Portland and Seattle will be an entirely new thing for the league. As we saw last night, week night is already underway but the weekend slate of games is jam-packed. Eight games on Saturday and one lone game on Sunday make for one busy weekend. Saturday alone will be one of the busier days in MLS with those eight games. I’ll admit it’s cool but at the same time it’s almost nicer having things spread out a little more with a Friday game. Anyways, with all that is going on here this week, here are the things that I am keeping tabs on this weekend. 1. Double dips. Another week down and another week where multiple teams play twice in the week. All six of last night’s participants (seven when you count New York) play games this weekend. At least for the Red Bulls they have an extra day off and play on Sunday. But for Philadelphia, Vancouver, Toronto, and LA, the travel of this week alone (along with last weekend’s game) will be interesting to see whether or not it takes it’s toll on the clubs. Only Dallas has a little easier path here as they were in D.C. last weekend and then are home for two straight this week. None of the rest of the clubs can say that. 3. Which Revs will stand up? Vancouver is no push over and we know they can score at anytime, just ask San Jose. But for New England they have to figure themselves out here against a defense that is still getting healthy here. Steve Nicol needs to figure out the best way to use Benny Feilhaber, Shalrie Joseph and Rajko Lekic. In their first game together they looked good, but then again it was against a weak Kansas City defense. Early struggles against Vancouver on Saturday will either lead to a draw or another disappointing loss. 4. D.C. finding the back of the net. Colorado is banged up all over the place on offense, yet they’re starting to get results which is dangerous. But going to D.C. is never an easy thing for this club and United are playing better here. Last week they struggled to get anything going against Dallas though and had it not been for Kevin Hartman they could have easily gotten three points out of that game. The Rapids defense won’t give up a lot of space for Charlie Davies and company to work. I thin the biggest thing for United is finding ways to get Andy Najar in spots where he can be his dangerous self. 5. Bend not break in Dallas. One thing we know about Philadelphia right now is that their defense does not break too often and that their offense has yet to really get going here. They’ve been in a lot of 1-0 games and 1-1 draws so we can probably expect more of the same this weekend in Dallas. FCD has been solid defensively lately with a couple shutouts in recent games and not a lot of goals from their offense now that David Ferreira is out with a bum ankle. I’d expect a 1-1 game or even a 1-0 game between these two but wouldn’t it be great is this one ended up in a wild 3-3 affair? Gosh I hope so, just for the fun of it. 6. New path for RSL. The game against Houston this weekend will mark the first one without Javier Morales. Now, they’ve been without him before due to injuries so losing him isn’t something new to Jason Kreis. What is new about it is the length he’ll be out. Long term injuries can be tough on any club to deal with, even good ones like RSL. Getting off to the right start early against Houston will be key. The Dynamo were looking strong up until last week when they dropped two ugly games in a row. I think we’ll see a focused RSL team that shows tehy can move on without Morales here. 7. Back at home, back on the road. For LA it’s hard to believe it but this will be their 12th game of the season when they host Sporting Kansas City (playing their 7th straight road game). No doubt LA will feel upset not to get three points in Philadelphia last night but they’ll bounce back in this one against a Sporting team that has struggled defensively so far this season. Landon Donovan has got on the scoring path here with his fifth goal of the season last night. Against a leaky defense like Sporting, you have to think they’ll put this one away early, similar to how they dominated Portland a couple weeks ago. 8. Home cooking for San Jose? The Quakes can’t catch a break. They go up 1-0 on the road and carry that league throughout the game until the last moments against Vancouver. Thing is they looked better in the 1-1 draw last night in Vancouver and returning home to face the Columbus Crew could be a nice thing for them. The Crew typically don’t play that wel out west and San Jose will be wanting to push for the three points at home here. They’re the only team (not named Kansas City) to not get a home win this season. You think that will be weighing on the minds of Frank Yallop and company? 9. Let the fun begin in Seattle. I could spend more time on this game between Portland and Seattle but there really is no need. Everyone will be talking about this game all weekend and what this rivalry means to the league. Its a shame that Qwest Field won’t be opened up more for this one as you know they could easily sell-out the joint with the Timbers fans that will travel north to see this one. Maybe I’ll touch more on this one tomorrow but we already know this is a big game. 10. New York state of mind. So it appears the Red Bulls went to Montreal and lost last night. Ouch. Sure it was a friendly but you know Hans Backe can’t be happy about that one, especially considering he used starters for the first half and had Juan Agudelo go the full 90. Its not a huge deal though to lose an early season friendly like this. They’ll be back home for this one come Sunday against Chivas USA, a team that defensively could pose a challenge to them. I’ve been impressed more and more as each week goes by with this Chivas club, even Dan Kennedy in goal who was a monster for them against RSL last week. New York will need to get their attack going early in this one and get Thierry Henry involved early. I thought LA showed a way to beat NY last week with some high pressure but I doubt Chivas can do the same. This is gonna be awesome, but I’m most excited for New York!